The 1914 Christmas Truce has become the most enduring episode of that curiously companionable combination of sport and war. Regularly recounted or referred to in television programmes, books, feature films and even a pop music video, it was Christmas Eve, the singing of carols and a game of football played in No-Man's Land. Then there is the Twickenham army captain, Billy Nevill, on the Somme in 1916, who, on the first day of that shattering massacre, led his company towards the enemy lines dribbling a football. He became a national hero. His name joins those of the 120 other young men on the Memorial Cross in St Mary's churchyard, Twickenham, listing all those from the parish, who fell in the Great War. Yet the name of Nevill's inspiration, the rifleman who led the charge at Loos kicking a football a year earlier, and who died in the neighbouring parish of Whitton, remains firmly on the bench. It was just before dawn on September 25th 1915 when the otherwise unremarkable French mining village of Loos found its hallowed place in military history. The biggest artillery barrage of the war so far begun almost a fortnight earlier had reached stupefying proportions. The men of the London Irish Rifles moved up under cover of the noisy darkness. Besides rifles, some carried grenades and clumsy looking tubular bombs and all had strange, goggle-eyed masks of grey flannel to pull over their heads like hoods. At 4a.m. the experts agreed that there was sufficient wind to send poison gas rolling for the first time across No-Man's Land from the British trenches. It had fallen on the London Irish Rifles to lead the attack. The offensive was vital to the whole Allied war effort desperately needing a victory to boost morale. By 06.15 the wind changed again slightly. Gas and smoke came drifting back, causing the crude gas helmets to be immediately pulled on and tucked into collars. Many men slow in adjusting their masks fell choking to the floor of the trench. In his regimental history of the 1st battalion London Irish Rifles, 2nd Lieutenant S F Major then recalled a sight that astonished him. Rifleman No.1751 Frank Edwards fumbled in his haversack then cautiously drew out a deflated leather football. He was disobeying orders, but he put the bladder to his lips calmly began to blow, 'as though the matter- in-hand was going to be a cup-tie!' Edwards had cherished the idea of dribbling the ball into the enemy's lines for some time. It was discussed freely but frowned upon by Command. So much so that his platoon officer, Captain Dale, had put a bullet through one ball and ordered Edwards' ball to be deflated. 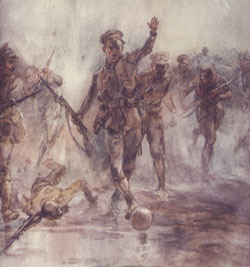 But whatever lay in wait for them, Edwards firmly believed that the sight of British soldiers coolly passing the ball from one to another would give the enemy their biggest shock of the war. 'Just imagine, as I did,' he later recalled, 'a party of London Irishmen, with our war cry of 'Hurroo' charging across No Man's Land passing the ball forward to finish up the mad rush by leaping into their trench with the rifle and bayonet'. When the order came to go over the top, Edwards lobbed the ball ahead, as a goalkeeper might fling it back up the field. Some of his pals, fellow footballers, spread out like a line of forwards and went after it: Micky Mileham, Bill Taylor and Jimmy Dalby were three whose names are linked to the record of this exploit. A hefty kick came off the boot of rifleman Mileham who then passed it to Dalby and on to Bill Taylor, all the while shells bursting among them and shrapnel screaming overhead. The ball continued in play before the line of charging eerie hooded shapes disappeared through the drifting, poisonous fog. Where it eventually finished up, Second Lieutenant Major did not see, but believed it was up by the German wire. For some of the London Irish who kicked and passed the ball it was the last game they played. Edwards himself failed to reach the enemy lines, going down wounded, with Micky Mileham stopping to fix the tourniquet that saved his pal's life. Edwards spent almost a year convalescing. Although the gunshot wound to his thigh eventually healed, the effects of gas poisoning would affect him for the rest of his life. His general recovery, however, was remarkably good. Over the course of the next two years he had been awarded two Physical Training and Instructors Certificates. On discharge on 5th February 1919, he immediately re-enlisted in the Military Foot Police. With the tenth anniversary of Loos passing without any official recognition, the London Irish Rifles Regimental Association marked the occasion a year later, on 24th September 1926, with a grand Torchlight Tattoo held in the spacious grounds of the Duke of York's Headquarters, Chelsea. The famous charge at Loos was re-enacted as the climax with the 'Mad Footballer' himself invited to re-enact the audacious episode. A series of temporary positions followed Edwards' discharge from the army in December 1935. Two years later he secured an appointment as a NSPCC Inspector, moving with his family to the Central Glamorgan local office in Bridgend, South Wales, where he quickly gained a fine reputation. Just before Christmas 1943 Edwards decided to return to war-torn London where he and his family took a house on Twickenham Green, no27. He worked variously as a Swimming instructor, an office manager at the local Crimony factory and for a Teddington engineering firm. For a while, he was a batman at the Royal Military School of Music, Kneller Hall. A year after his wife died in 1956, he came to stay with his daughter, Daphne, in Colonial Avenue, Whitton, where he died in January 1964. More than 61,000 casualties were sustained at the Battle of Loos, over 50,000 of them in the main fighting area between Loos and Givenchy, and the remainder in the subsidiary attacks. Of these, 7,766 men died. Casualties were particularly high among Scots units. Many New Army units, rushed into a battle area for the first time only a matter of days after landing in France, were devastated. A significant proportion of the remaining pre-war regular troops were lost, and more than 2,000 officers were killed or wounded. This irreplaceable asset in experienced men and leaders was a most serious loss to the rapidly diminishing 'old' British army. While The Footballer of Loos may have become one of many forgotten voices of the First World War, it is as well to keep it in perspective. Suffice to say that in sport there are winners and losers. In some sports there can be a tie. Battles can be won and lost, but in war there are never any winners. Source: The Footballer of Loos: A Story of the London Irish Rifles in the First World War. Ed Harris. The History Press. ISBN 978-0-7524-5166-4.